I am using SVD/PCA for text mining purposes. Having a $(|terms|,|documents|)$ normalized matrix $M$, by applying SVD, I should be able to reduce the dimensionality and just keep the most meaningful dimensions. Should I perform a dot product with $\Sigma$ on $U$ and/or $V^T$? Why are some documents so distant from the words, since they surely contain at least one of them? Browse other questions tagged pca text-mining svd or ask your own question. 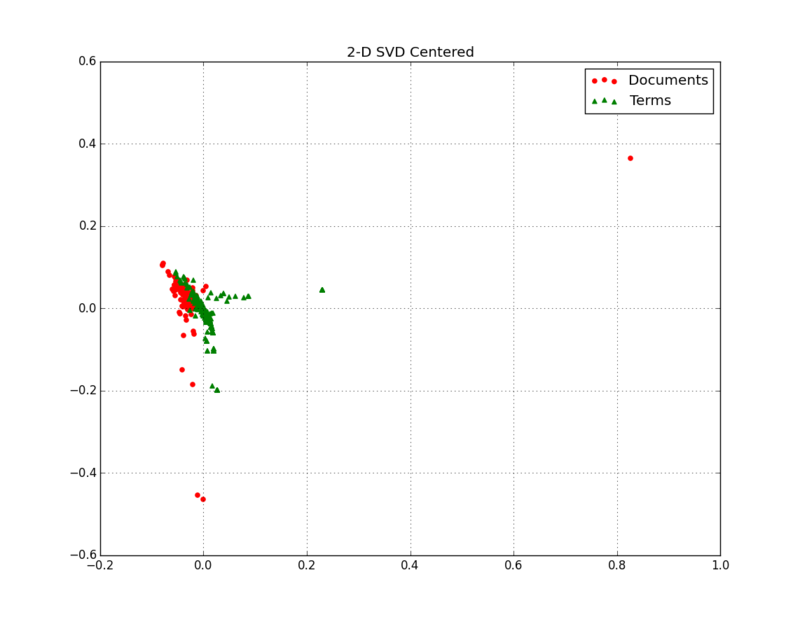 What are the differences among latent semantic analysis (LSA), latent semantic indexing (LSI), and singular value decomposition (SVD)? SVD for PCA: Why would one standardize the data matrix?